You’ll be enthusiastically welcomed when you walk into our beautifully decorated, open-concept clinic. Our upbeat staff brings a wonderful energy to our warm ambiance, greeting you by name and offering you organic tea or apples. Feel free to relax while a great selection of music plays in the background and you enjoy the natural light that comes in from our many windows. You don’t have to worry about parking at City Centre Health Edmonton Chiropractic — there’s plenty in the area. Click here to find out where. We ask that you arrive 15 minutes early to complete all necessary paperwork. When you walk in, you’ll be greeted by one of our friendly team members. We’ll show you around the clinic, then invite you to our exam room for the initial examination. You’ll have a brief conversation about how we operate, putting your mind at ease. so they can create the life they want. If you require X-rays, we’ll refer you to another facility where X-rays are covered by Alberta health care so there is no out of pocket expense. Once we’ve gathered all necessary information, you’ll be scheduled back for your Report of Findings visit. You’ll receive an information package to take home and read over, and be done in approximately 30 minutes. On your next appointment, Dr. Niz has thoroughly analyzed your test results and is ready to give you a Report of Findings. We pride ourselves on educating patients, talking to you about your current state of health and how the recommended program will help you. Dr. Niz will answer all your questions, then discuss the different care options that will help you achieve your health goals. Once you’ve decided what works for you, we’ll get started on your care program. You’ll then be scheduled for future visits. Your care program will involve a series of visits that build on each other. We understand your time is valuable and make each appointment as efficient as possible. Treatment times may vary depending on the program you’ve selected. Our team will discuss with you how long your visits will take. For example, when you arrive, you may want to go on our whole body vibration plate to help train your posture, then see Dr. Niz for an adjustment or get an adjustment first than head over to the vibration plates for 5-10 minutes. 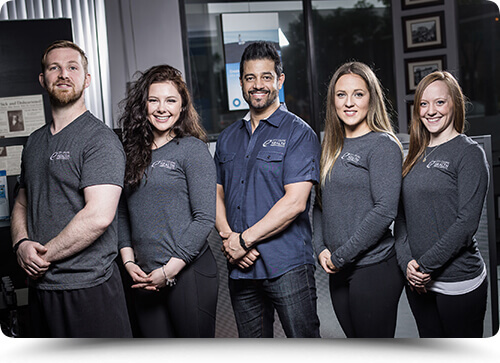 Reach out to our helpful, friendly team today to book your time!